Author Lois Joy Hofmann Will Discuss Sailing around the World during August Book Tour. Hofmann’s latest book, The Long Way Back, is the third in her “In Search of Adventure and Moments of Bliss” series. 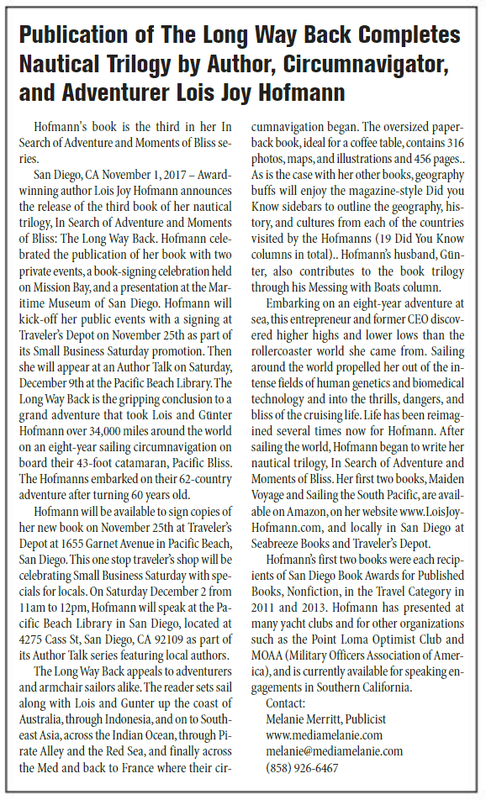 BALSAM LAKE – July 27, 2018 — Award-winning author Lois Joy Hofmann announced the release of the third book in her nautical trilogy, “In Search of Adventure and Moments of Bliss,” in San Diego last November. Now she plans to introduce the book series in Wisconsin and Minnesota, where she grew up and spends her summers. 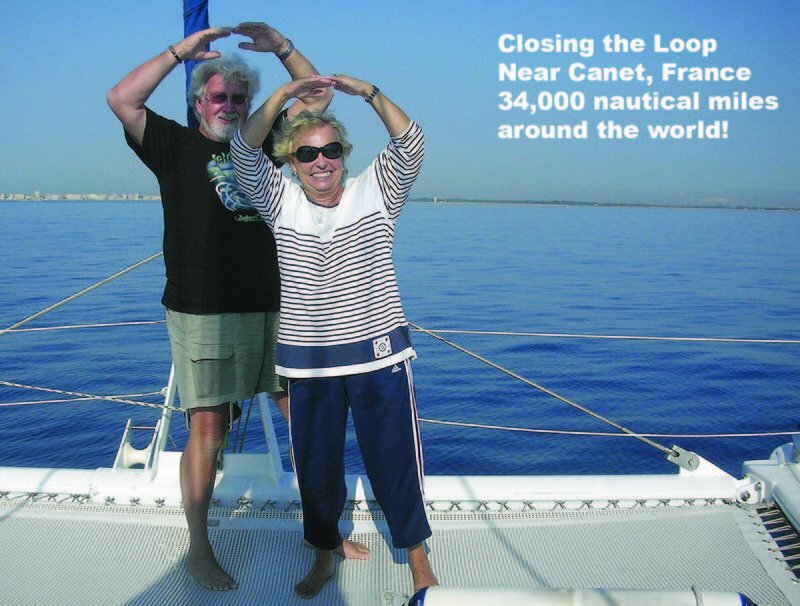 The Long Way Back is the gripping conclusion to a grand adventure that took Lois and Günter Hofmann over 34,000 miles around the world on an eight-year sailing circumnavigation on board their 43-foot catamaran, Pacific Bliss. The Hofmanns embarked on their 62-country adventure after retiring, already in their sixties. Each book takes the reader one-third of the way around the world. Hofmann will focus on the last third of the world during her Author Talk: the Eastern and Northern coasts of Australia, Indonesia, Southeast Asia, the Indian Ocean, the dreaded Pirate Alley from Oman to Yemen, and up the Red Sea to the Mediterranean. August 11: Osceola Public Library, 1 p.m.
August 16: St. Croix Falls Public Library, 4 p.m.
August 18: Amery Public Library, 10:30 a.m.
August 22: Balsam Lake Public Library, 6 p.m.
August 25: Chapter2Books, Hudson, WI, 11 a.m. The talks will be followed by Q/A sessions. Lois will stay afterward to sign books for sale. These oversized paperback books, ideal for a coffee table or home library, each contain over 200 maps, photos, and illustrations. Geography buffs will enjoy the magazine-style Did You Know sidebars that provide nuggets of information about the geography, history, and culture of each of the 62 countries visited by the Hofmanns. Hofmann’s husband, Günter, also contributes to the books through his Messing with Boats column. now for Hofmann. After sailing the world, Hofmann began to write her nautical trilogy. Her three books, Maiden Voyage, Sailing the South Pacific, and The Long Way Back, are available on Amazon, on her website at https://loisjoyhofmann.com/buy-books/ and locally at Chapter2Books https://chapter2books.indielite.org/ in Hudson, Wisconsin. Nonfiction, in the Travel Category in 2011 and 2013. Her stories have appeared in magazines such as Latitudes and Attitudes, Cruising World and Living Aboard. Hofmann has been a contributor to online magazines and blogs and has presented at yacht clubs, civic organizations, optimist clubs, MOAA (Military Officers Association of America), and is currently available for other speaking engagements. Lois is currently traveling; she will be available for interviews after August 6, 2018. Read article about Lois in the Beach and Bay Press.